When your research has shown that there are relevant skills shortages in certain parts of Australia, your next step might be to find or contact employers in your preferred city/ies or region/s, who may be interested in employing you. Doing this effectively, so that you actually get a response, is easier said than done: this is where things become negative: you may be in with a chance, but it's likely to be an uphill battle! Be prepared for a fight! In general, employers prefer to attract local staff: if they do, they can interview them personally in situ and they avoid all the hassle of dealing with DIAC. So, when you apply from overseas for a job advertised on the Internet or in the press in Australia, landing that job is virtually impossible. Check out any of the employment sites on the Internet and you will see that almost invariably you have to have PR (Permanent Residence) in Australia in order to apply - it's a "Catch22" situation: an employer won't offer you a job if you don't have a visa and you can't get a visa if you don't have the offer of a job. What we are saying is that, as a general rule, applying from overseas for a job advertised in Australia is a waste of time, even if you are in principle eligible for a visa. So what can you do if you believe you would get a visa if only you had the prospect of a job and it's clear that there is no point in applying for an Australian job from overseas? 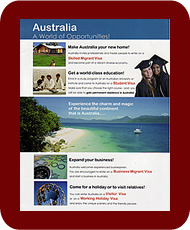 Because these days the offer of a job is so often the key to a successful skilled migrant visa application, AMES has formed a close alliance with AustJOBS, so that we can publish on their web site the Professional Profile of every client we have, where they can be accessed by prospective employers from all over Australia. You will also be able to view on the AustJOBS site the positions employers are looking to fill from overseas because they can't find a suitable candidate locally. EMPLOYMENT IS THE KEYIf you want to get to Australia in less than a year, you need to have a job lined up for you. Click this link to find out how to show your Professional Profile on the AMES AustJOBS Talent Exchange site to improve your chances. they had done a lot of research on the companies and businesses that might want to employ them. In order words, they came to Australia well prepared and with a clear focus - it was not a holiday! When you are actually in Australia (as a visitor, or as a student, or on a Temporary Visa) you will be able, of course, to apply for jobs in response to an advertisement, but the reality is that employers are reluctant to employ someone who does not have Permanent Residence: they know that dealing with DIAC is a nightmare and they know that if DIAC rejects your visa application, they will be back to square-one. Here your relationship with AMES can be of value again: we can help you overcome an employer's resistance to giving you the job they would like to offer you, because we can negotiate on your behalf, explain clearly what is involved and what is required of them as your employer, re-assure them that your visa application is likely to be successful and explain why, and generally guide them through the process and turn their involvement with DIAC from a nightmare into an experience that is not overmuch unpleasant. They will have to do some extra work, of course, but if they really want you to work for them, they will find it's worth the effort.